Charity and gala usually conjure up thoughts of a long evening with a boring sit-down dinner with speeches. But in Miami, an entrepreneurial group of South Beach guys created The Little Lighthouse Foundation and host two signature fundraising events a year, “Hearts & Stars Gala” in the Spring and “Nightmare On The Beach” in the Fall around Halloween. Hearts & Stars Gala 2017 took place March 18 on Star Island with the theme ‘Mystic Dreams’ at the home of plastic surgeon, Dr. Lenny Hochstein & his wife, Lisa who starred in “The Housewives of Miami”. This was the first party hosted at the Hochstein’s newly built waterfront mansion. Guests were wowed as they entered with what looked like a Miami White House, but awash in brilliant neon colors and patterns over the façade and stately columns. 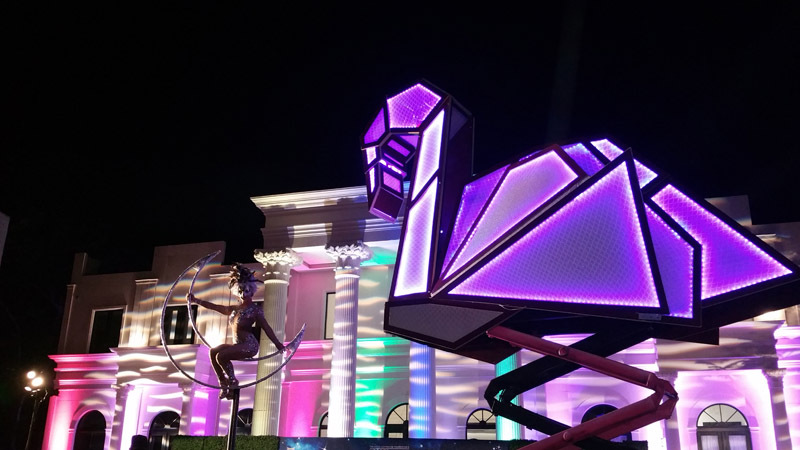 A supersized swan sculpture with matching neon tints was front and center in the front courtyard area. An entertainer dazzled hanging from a moon-shaped swing suspended in mid-air. Greeters with ORA shades covering their faces promoted their nightclub After Party bestowing everyone with wristbands for complimentary entry later in South Beach. Food from a variety of local restaurants and libations were generously donated keeping the guests full of energy into the wee hours. At what seemed to be around the stroke of Midnight, guests were allowed to proceed to the backyard of the estate. Here party revelers were mesmerized with the amazing sounds and lights emulating from the DJ stage. Marcos Noel, Patrick Pizzorni, and Willy Monfret shared the DJ spotlight throughout the evening. The DJ backdrop was trancelike with psychedelic patterns playing on the back wall. Lights shows were also sprayed across the lawn as well as more projections on the back façade and columns of this massive mansion. There was a VIP area with bottle service for guests to lounge in before or after hitting the dance floor. Sweet delights with the Hearts & Stars logo and name compliments of the Sweet Addicts Bakery were decorating the dessert table to give an added sugar rush. Top shelf Ketel One and Tito’s Italian sparkling wine kept flowing til the end. Fiji & La Croix waters kept everyone fully hydrated. In all about 800 guests attended this year’s 8th annual gala. Notable VIPS included Janice Combs, Bravo’s Southern Charm star Whitney Sudler Smith, Miami Dolphins linebacker, Kiko Alonso and LLF founders, Aaron Resnick, Rob Sena, Charlie Venturi and LLF’s Executive Director Jonathan Babicka. The event raised over 100 thousand dollars to benefit programming for underserved children in South Florida. The Shining Light Award was presented to Justin Keener of JMJ Financial and the Volunteer of the Year Award went to Loren Psaltis. A live and silent auction contributed to the fundraising efforts. The Hearts & Stars Gala was actually a 3 night affair with the kick-off on Thursday evening at The Deck at Island Gardens overlooking Miami’s new Super Yacht Marina. Friday was a more intimate affair for top donors and supporters at Villa Jasmine, a waterfront home on Sunset Island. Mystic Dreams came to an end around 2pm as the UBER’s lined up on Star Island to take all the revelers to ORA or home. The Little Lighthouse Foundation supports children and their families who struggle with educational, financial, and medical hardships. This support comes through the deployment of LLF’s volunteers and/or select financial contributions. Beneficiaries include children, families, and select child orientated charities throughout South Florida. For more information, visit www.thelittlelighthouse.org. The proceeds from the Hearts & Stars Gala Weekend go to benefit the Little Lighthouse Foundation and its programming. Additional information about the weekend, the Opening Party and the Gala can be obtained at www.heartsandstarsgala.com.